Acer has just announced its Predator Thronos, a gaming chair so totally 1337 and exorbitant that it defies all reason whatsoever. The chair itself, or “gamer’s cave” as OEM giant Acer refers to it, is a motorised cockpit capable of fitting three 27-inch gaming monitors within its 1.5 metre tall steel chassis. The best part of the massive Predator Thronos chair has to be the mechanised reclined seating position with automated footrest that pops out at the push of a button. Nothing screams elite gamer more than an ergonomic gaming chair, keyboard and mouse, and footrest unfurling to a 140 degree angle before you jump into a game of Snake Pass for total slithery immersion. But that’s not all the Predator has in store for gamers. No, the chassis also includes ‘Deep Impact Vibration Function’, which reacts to in-game action through vibrations sent through the Thronos’ gigantic steel exoskeleton. Perfect for a teeth-rattling, 100% true-to-life, Dirt Rally experience. It also features an integrated Predator PC, of which the finer details are not yet known. A rig like this seems catered to the high-immersion simulation experiences such as flight or driving sims. So far, we’ve not seen the Thronos with any flight sim equipment resting on that rather slim keyboard and mouse rest, but you’d hope its been built with some consideration for the bulk of high-end sim equipment. 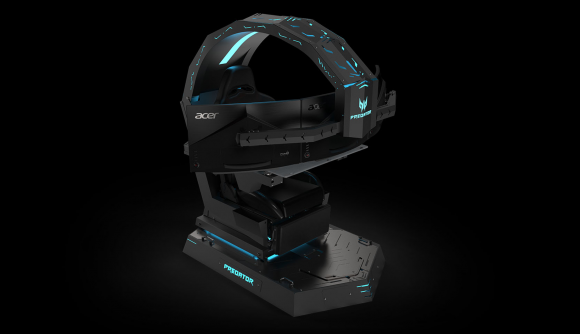 Acer also announced two new gaming monitors ready to slot into the Thronos’ overhead brace. The Predator XB273K is a 4K, 144Hz, Nvidia G-Sync equipped monster with an IPS panel for accurate colour reproduction. This will launch later sometime in Q4 this year for $1,300, but surely you’ll want three of them, correct? But if you are trying to save a little money and want to find a monitor that’s a little less expensive to fit inside your gargantuan gaming throne, the Nitro XV273K gaming monitor might be right up your alley. There’s three models overall: two 1440p models, one IPS and one TN at $499 and $449 respectively, and one 4K IPS panel that starts life at $899. All three feature 144Hz refresh rates, but the 4K one also comes with DisplayHDR certification up to 400 nits. We don’t have a price for the gaming chair of champions yet, but surely Acer doesn’t intend on actually shifting many units of the Predator Thronos, right?